"I would never consider a patient healthy unless he had overcome his prejudice against homosexuality." Dr. Weinberg lives in Manhattan. His latest book, co-authored, is titled Will Power (St. Martin's Press, 1996) and he has just finished another--not yet out-- about practical principles in the Bible. Badpuppy: How did you come to coin the word "homophobia?" Weinberg: After seeing in the 1950's and 1960's the enormous brutality against gays and seeing that I myself couldn't introduce known, professed homosexuals even to my friends who were supposedly liberal or psychoanalysts --that they always had reasons for avoiding these people. They weren't at all distressed by the worst kinds of brutalities toward gays. I realized that something else was going on-- more than simple mis-education. This was some deep emotional misgiving these people had, some phobic dread. It seemed to me the problem was theirs, not the homosexual's. I knew a landlord who had two lesbians living on the 5th floor of his brownstone and he couldn't sleep at night at the thought they were up there making love, and obviously the problem was his, not theirs. After trying to introduce gay friends of mine to heterosexuals in those days I just almost couldn't make the bridge. They always found reasons not to invite them to their homes and I realized that this is a classical phobic revulsion. They exhibited the same traits as your claustrophobic, your agoraphobic except that they were traits toward gays. I realized when I went to Washington D.C., a woman I met there was terrified about being alone in a room with me. As soon as her male friends left the room she began to tremble and almost couldn't speak and I realized she thought I was a homosexual and she was extremely phobic about me. I recalled a comment by Oscar Wilde's brother: "I don't know why they say Oscar's immoral. Any woman is safe with him." and it turned out-- I realized this was something that had a very deep root, a classical phobia, but of all the phobias, the most destructive being homophobia. Claustrophobia or agoraphobia---if you can't go to the theater or outside---or you have almost any kind of dread but it doesn't ordinarily get converted into the violence. These were recognized as phobias, but this---homophobia-- was not recognized as one. Badpuppy: You're a gay lib pioneer, active as early as 1965, inspiring gay movement groups. Weinberg: Partly because I'd felt such appreciation, whether it was Tchaikovsky, or Michelangelo, or Shakespeare or my gay friends who discussed literature, art and music with me... Since states could put two consenting adults in jail for 10 years for nothing more than a homosexual act, the culture was haywire. So this got me involved. Badpuppy: Tell us about your pioneering book, Society and the Healthy Homosexual. Weinberg: Sasha Alyson recently republished it. St. Martin's took it after 11 publishers had turned it down, saying there were already books on homosexuality and we didn't need any more. Badpuppy: That's when there were hardly any books. Weinberg: All negative one way or another. My own feeling at the time was that there needed to be a lot more dialogue. The big opportunity I got was writing for GAY in 1970-73, which allowed us to explore a lot of the critical issues and getting people to discuss the prejudices. Badpuppy: Tell us about your newest books. Weinberg: The Taboo Scarf, and Nearer to the Heart's Desire, short stories relating to my therapy practice. I have a book called The Heart of Psychotherapy which is sort of the basic primer in the field. I wanted to bring--Carl Jung has a term-- "the antiseptic power of consciousness"--that cleans many wounds when you're conscious of what is going on and I've always felt that consciousness would bring a great deal more humanity to all of us. I tried to work from within the psychological and psychiatric profession in order to leaven attitudes so that any contribution that gay men and lesbians made could be integrated into the mainstream without their having to hide. Nothing was more painful to me. Badpuppy: What are you working on now? Weinberg: I'm just getting ready to turn in the manuscript for 15 practical principles from the Bible, principles on everyday living. The Bible is very mixed in its attitude toward sexuality. There's been a lot of talk about it, but of course Jesus never condemned homosexuals and never condemned any deviant group-- never said anybody was lost--so. He always stood up for the out- cast: the prostitute, the child, even the fig tree that wasn't yielding fruit one year should not be cut down. Badpuppy: What's your 1996 book, Will Power, about? Weinberg: Taking ideas from Shakespeare and using them in every day life. A great writer is never lost. Even if he's superseded, his approach to problems, to the human condition, endures even if some theory he has is superseded. Badpuppy: Some see immortality not as a continuing physical presence, but of values and ideas. 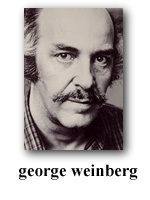 Weinberg: I love that. There's a line in Spartacus where, I think, he's being crucified and the woman says, "We did love once." And he replies, "Whoever loves once, loves forever."